I missed my own topic last week – I wasn’t feeling myself and the stress of trying to get a post up on time was just taking it out of me. So I’ve planned a bit better this week and I’ve not left it til the last minute! Tim’s topic is Video Game Weapons. I’m not sure mine will be a very exciting list this week but I’ll hive it a shot! 5. Diamond Sword – Minecraft. OK, let’s face it, this had to be a part of my list! I don’t play a wide range of games, but as Minecraft is one of the few I do play, the Diamond Sword just had to play a part in this list! 4. Dragunov – Call of Duty: Black Ops. I’m very much a camp & snipe kinda girl. Sniper rifles are very much my weapon of choice! This one is usually my ‘go to’ rifle as it’s a semi-automatic and, with the right attachments, is extremely accurate. 3. Longshot – Gears of War. Straight on to another sniper rifle! The Longshot in Gears is my ultimate sniper rifle. If I could use this in other games I would! 2. Razorblade Typhoon – Terraria. What. A. Weapon. It’s fast, it’s magic, it’s pretty, and it’s homing. What more could a girl ask from a sandbox game weapon?! 1. Lancer – Gears of War. 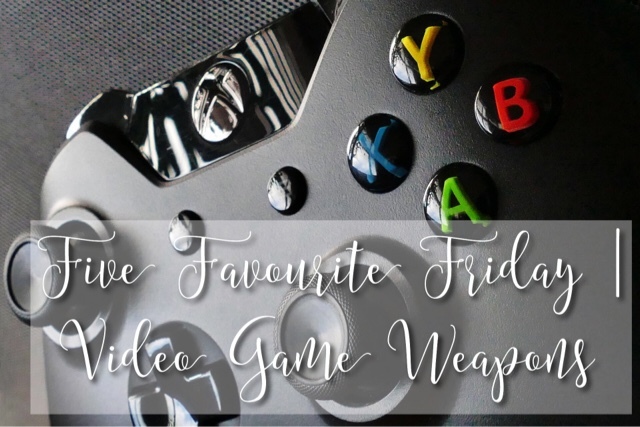 I fell in love with this weapon from the first time I picked up my controller to play Gears of War with my dad. It’s fully automatic, quick to reload, and the best bit? It has a fully functioning chainsaw attached to it! Chainsawing those locust in half is possibly one of the most satisfying gameplay moments ever. And there you go! 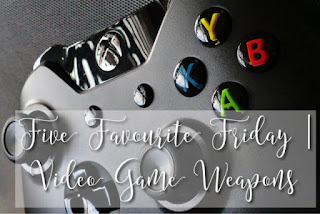 My list was going to consist of purely Gears of War weapons as there are so many that I just love, but maybe I’ll do that list another day. As always, head on over to Broken Thoughts to read Tim’s top 5. We’ll be back next week with our five favourite Board Games! I love playing board games, so I thought it would be fun to put together a list of our favourites!